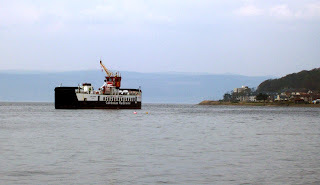 Caledonian Macbrayne's Loch Riddon resolves the issue of the lack of berthing during the reconstruction of Largs Pier 13 April 2009. In true "Loch" fashion, she just lies in the bay! On Sunday she dropped the hook (the first I think for Many Years), not quite where her forebears Coruisk and Largs lay, but they had a barrel!